Recently two close friends of ours – one single, in her thirties, one a single mom in her forties – have been in epic battles with cancer. Both have been on the edge of death. The first, a Korean friend of mine in Seoul, has been a sweet mentee of mine for years. We first met when she was 19 years old. I can remember her standing at my door under an umbrella (back in the day when it actually rained in California! ), dressed in a bright, striped sweater, a huge smile from ear-to-ear. Min Jee was a community college student at the time. She was looking for someone to mentor her in life – and in things of the spirit. I was a young mom at the time, swimming through the day-to-day, trying to come up for air from time-to-time. We hit it off immediately. A young Christian believer, over the next few years we’d get together and study a couple books of the Bible and went through The Purpose-Driven Life together (remember that?). We’d also just hang out. Min Jee loved our kids. She is one of the many international students in our home during those years as we participated in – and then led – an outreach ministry to college-aged international students and scholars in our area. But Min Jee stood out. She connected well with our kids, especially our daughter. After finishing her AA and then BA at another school in the area, she transferred to UCLA and completed a masters in Accounting. In what seemed less than a heartbeat, she managed to pass the CPA exam (no small feat!) and was soon picked up by a Big-5 accounting firm. I visited her while she was down in LA. And then again a few times when she came back up to northern California, where we live. She was always so positive and constantly told us she was praying for us. Then she told us about five years ago she was ready to head back to Korea. While there, she continued on with her company but increasingly found herself drawn more to work helping impoverished communities get their finances back on track, as well as hands-on service. She went on a couple missions+service trips to Indonesia. Something in those experiences moved her to quit her high-paying job and work for a smaller startup. Last summer we had the opportunity to visit Seoul for five days. Min Jee was our primary contact there (although we met up with several others). She did so much to arrange for our trip, making it a very special occasion. We got to see so much more into the Korean culture – our first time – because of her care and attention. Not much later, she was in a car accident. While I don’t know all the details, I do know she experienced regular intense headaches from that point on. Min Jee almost married – twice. But both times, the relationships didn't make it. And Min Jee had some significant work to do in sorting out issues from her childhood (who doesn’t?). So, maybe, in the long run, the breakup of these relationships was a good thing. 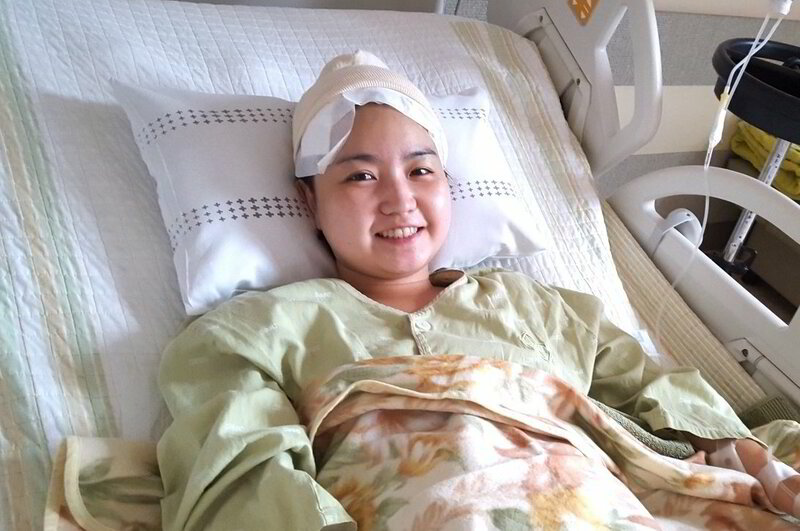 But the more recent one happened just a couple months before Min Jee landed in the hospital with a major brain tumor. The couple had set a wedding date. That itself seemed sudden because Min Jee had been out of contact a bit. I just chalked it up to the constant headaches. Then, boom! I learned from a close friend who had been like a mother to her of Min Jee’s brain tumor. Evidently, the doctors had thought the headaches were due to the car accident. Now we learned there was much more going on. I had the opportunity to chat with Min Jee through WhatsApp, though barely. She was just a few hours before her operation (they advanced the date because things were moving so fast), so her responses were simple. But I was able to reassure her we love her and were praying. I’m thankful for such forms of communication. But I also felt a bit helpless. We turned to prayer. And Facebook. I put up a rather anonymous call to prayer on my timeline and so many responded. I simply entitled it, “To Those Who Pray.” Friends far and wide – Christians, Muslims, Buddhists, Hindus, Agnostics and Atheists (and others) – responded. And, I believe, most at least threw up a prayer or two on my anonymous friend’s behalf. And we waited. Min Jee was not responding to text chats or calls through WhatsApp. My heart was so heavy. And I thought I had no way to confirm. The original source of the news was Min Jee herself. She had called Lena shortly before the operation to explain what was happening. She said she was going to connect Lena with her brother in LA who speaks English, but it never happened. So we waited. For two weeks. The other friend is American, a single 40-something mom with two teenaged boys. Unlike Min Jee, Ella has had a full on rallying team around her. When she discovered she had cancer, she immediately formed a Facebook group message and included us. Although we are not in locational proximity to her, we’ve felt as if we’ve been in on her journey every step of the way. Several faithful friends and family members have been keeping us up-to-date. So we learned when she began the chemo treatment for a large cancerous lump in her hip, Ella’s body responded actually better than expected. She was even doing well enough to post status updates consistently on Facebook. We cheered this development. Then about a week after treatments began, Ella took a turn for the worse. She got sepsis from the treatment, an infection mercilessly invading her body. Everything went south. She was rushed to the hospital and put into the ICU. As her body shut down, prayers went up. All over. Again, family and friends kept us constantly informed. The ability to know what was going on differed so much between these two friends. You might think it was because Min Jee’s situation was happening in Korea, with a language barrier, while Ella’s was happening in the U.S. and not so far away. I think it had to do with the way they fell into their conditions as well as issues of transparency. Often in Asian cultures cancer is treated in a more surreptitious manner. Sometimes the patient doesn’t even know what’s going on. Or, at least until recently, that’s how it was. The point was to not raise distress, to place an emphasis on harmony and peace. My husband and I got to talking and my wheels started spinning. Who do I know that may know Min Jee as well?!? Then I remembered two possible contacts. One was Hyun Jae, a friend in Seoul who spent a day with Min Jee, Dale and me when we visited last summer. They had not been friends previously, but they seemed to connect well that day. I didn’t know if they had stayed in touch, but thought she may be able to help. I also remembered Hae-Won. Although we had lost contact for a little while after she married a U.S. military friend, we were connected via Facebook. In fact, she had been popping up on my timeline more and I commented on a couple of her posts. She is living with her family in Bahrain at the moment. Hae-Won and Min Jee were friends from back in their times in Monterey. Ah, maybe here is the direct link, I thought. And it was. In no time, both Hyun Jae and Hae-Won were on it. I mean, no time. After composing a message about what was happening, both of these ladies responded within minutes! I have no idea what time it was in their respective locations, but I was almost headed to bed. I was so excited about their connection. Thanks to this new connection between Hyun Jae and Hae-Won, we figured out Min Jee is still alive and recovering from her brain surgery! She’s even at home now. Resting a lot. But she knows many love her and have been praying. We’ve been in touch. In fact, she even approved me sharing these photos from her recovery in the hospital. And Ella? She is on the path to recovery as well! She has been such an inspiration. Knowing her, she would say the power has been in the Wonder Woman cap one of her friends sent her. We could see she was recovering when she took to Facebook and became decidedly vocal. She is back now! Both these women are not in the clear yet. But they have community praying and caring for them now. It’s been a beautiful sight to behold. No question, this is one of the best ways to use our technology today. That, itself, is crystal clear. Have you ever experienced a jolt to your regular life this way? How have you used it as an asset moving forward?